Hot cakes and grits? Freshly-baked and fluffy biscuits? Don’t mind if we do! Get all the Southern charm your heart desires at one of Alabama’s excellent breakfast spots. These 10 places all provide classic breakfast dishes with a down-home Alabama twist. 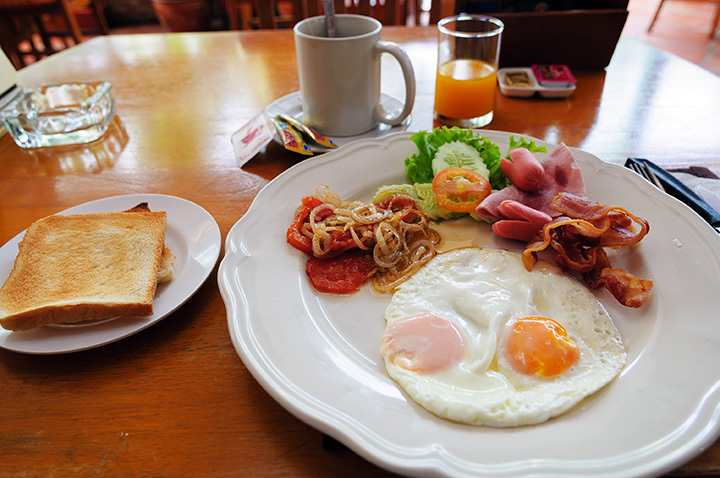 If you’re a foodie who appreciates locally sourced food, look no further than T Town Café for your breakfasting needs. From biscuits to French toast to fried egg sandwiches, T Town will always have what you’re looking to eat. Biscuits, biscuits, and more biscuits, all made with fresh ingredients. The Alabama Biscuit Co. hosts a menu of all things biscuit, taking new and delicious twists on a simple favorite. Two of their best biscuits are the Pecan butter and honey biscuit and the Croque Madame. Stop by for stellar service and fluffy treats that will have you craving more. For a warm and friendly atmosphere and great food, visit Kitty’s Café in Gulf Shores. From heartier plates to lighter meals, Kitty’s has everything. It’s the friendliest little place by the shore. In the heart of historic downtown Mobile sits the cozy café, Spot of Tea. Known for their omelets and waffles, their menu boasts wonderfully-curated plates. For an extra special treat, try their perfectly made Monte Cristo sandwich. From great food to their beautiful outdoor patio, Spot of Tea has that true Mobile-feel. If greasy spoon joints are your cup of tea, check out Salem’s Diner in Homewood. Their menu is full of classic breakfast plates, not to mention cheesy grits that are some of the tastiest in the South. For a casual atmosphere with outdoor seating, take a load off at Tacky Jack’s. They regularly host live music, and have a brunch menu that is worth the hype. Hang out by the water and enjoy the morning with tasty pancakes and eggs. The quaint, mom-and-pop feel of Hazel’s Nook is the perfect place for a quiet breakfast. With amazing service and a scrumptious assortment of breakfast items, Hazel’s Nook is sure to become a favorite. Classic Southern dishes do not get much better than Blue Plate Café. Their menu sports a variety of delicious breakfast plates, but their biscuits and gravy are simply to die for. For good service and Southern charm, check out Blue Plate. Inspired by Oxford, Mississippi’s legendary Big Bad Breakfast, Over Easy is an example of simple breakfast done right. Their healthy portions of food will leave you happy and full of delicious food. Among their stand out menu items are their huevos rancheros, Italian eggs benedict, and Pepe Le Toast. Over Easy also boasts a list of creative omelets that are sure to satisfy. If you’re looking for a low-key place with your favorite breakfast essentials, Duck’s Diner is the right place for you. From their long list of omelets to their fluffy pancakes, the quaint joint will grace you with Southern hospitality and breakfast foods all day long.